Across the Capital businesses of all shapes and sizes are creating healthier workplaces for employees and last month a local employer was among those to be recognised for its work to improve the health and wellbeing of staff. 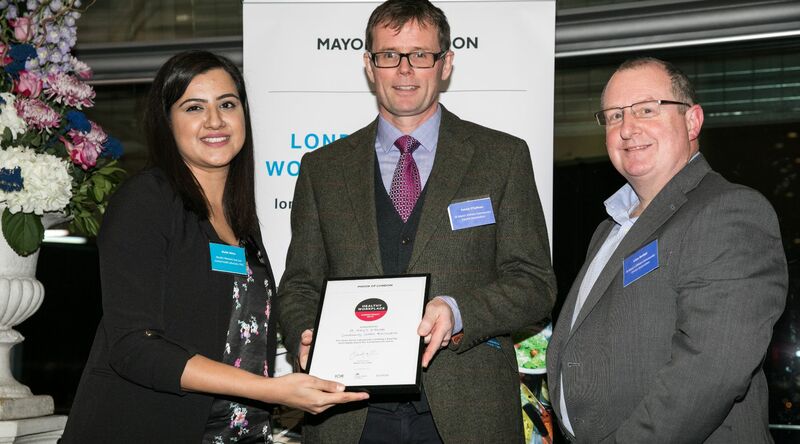 On 19 November, St Mary’s Eltham Community Centre Association joined a host of organisations, working across a range of industries and areas, to gain the Mayor of London’s Healthy Workplace Charter, at a special ceremony held at City Hall. Funded by the Mayor of London and backed by Royal Greenwich, the Charter is a simple and effective scheme, that helps businesses work towards better health and wellbeing for employees. To be a healthy workplace, employers adopt ways to support workers on issues such as mental health, physical activity, and healthy eating. Local businesses have been making strides in all these areas; training up staff in Mental Health Awareness, encouraging physical activity through organised lunchtime walks, and promoting healthier eating habits by making healthy options available at lunchtimes. From a potential or existing employee or volunteer’s perspective, accreditation offers a mark of assurance that your organisation supports and values the wellbeing of its workforce. Patrick O’Sullivan and Julian Bartlett, who accepted the Commitment Mark for St Mary’s, are now working towards the Achievement level under the Charter. They join the ranks of almost forty accredited workplaces in Greenwich, covering over 28,000 employees working across the borough! The Royal Borough offers tailored support to businesses to help them achieve the London Healthy Workplace Charter. To find out more and to register interest, visit london.gov.uk/healthyworkplace. Find more on improving health at work.